KAVRE DISTRICT, Nepal, May 5 2015 (IPS) - Just over a week after a dreadful 7.8 magnitude earthquake rocked Nepal, displaced families are gradually – but cautiously – resuming their normal lives, though most are still badly shaken by the disaster and the proceeding aftershocks that devastated the country. However, delivery of humanitarian aid and basic relief supplies remains slow, hindered by the scale of the tragedy. With the annual summer monsoon just around the corner – and heavy rains already lashing some parts of the country – experts say the clock is ticking for effective relief efforts. As of May 3, the death toll was 7,250 in 30 districts, with half of them in Kathmandu and its neighbouring Sindupalchok district, according to the Nepal Red Cross Society (NRCS), the largest humanitarian NGO in the country. A further 14,122 people have been injured. Over one million families have been displaced in 35 districts, while over 297,000 houses have been completely destroyed. The United Nations says close to eight million people – over a quarter of Nepal’s population of 27 million – have been impacted by the crisis. Of these, about 3.5 million are in need of food aid. The World Food Programme (WFP) has issued an urgent appeal for 116.5 million dollars to deliver aid to those most in need – some 1.4 million people – over the next three months. The U.N.’s Food and Agriculture Organisation (FAO), meanwhile, is worried about the plight of the country’s wheat harvest. The agency had predicted a yield of 1.8 million tonnes in 2015, but is concerned that this forecast will change, as farmers struggle to access devastated fields and deal with severely damaged drainage systems and irrigation canals. As the government scrambles to meet the needs of its people, the U.N. Children’s Fund (UNICEF) announced Tuesday that it had begun to airlift 80 metric tonnes of humanitarian aid to the worst-affected areas. “We have stopped crying out of fear because we need to move on now and be brave,” 13-year-old Sunita Tamang tells IPS, hugging her best friend – 12-year-old Manju Tamang. The girls hail from the remote Ghumarchowk village of Shankarpur municipality, 80 km from the centre of Kathmandu city. Both of their families lost their homes, cattle and food stocks in the quake. Their school remains dilapidated and though they are desperate to resume their classes, they must patiently wait out the month-long government-declared closure of schools in case of further natural calamities. 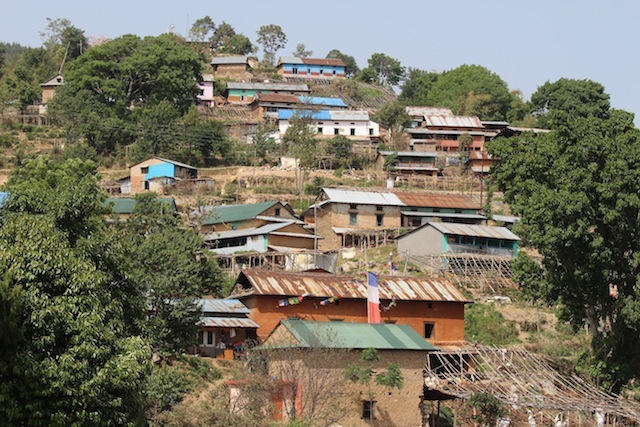 In this village, which is only accessible after a steep, three-hour uphill trek, most of the 500 homes remain unsafe for residence, a major obstacle for families who are getting tired of sleeping under the stars in their potato and squash farms where they are living in makeshift tents, nothing but thin plastic sheets covering their heads. The torrential rainfall that is lashing this village makes life in agricultural fields difficult, as the ground becomes too muddy to sleep on. “I would rather return home and take the risk,” a social worker named Bikash Tamang from the Scout Community Group tells IPS. The National Society for Earthquake Technology-Nepal (NSET), which aims to create “earthquake safe communities in Nepal by 2020”, has begun a series of assessments of major offices and residential areas across the country. Chief of communications for the NSET tells IPS in Kathmandu that the organisation is assessing the extent of the damage, to ensure that key service providing agencies within the government, as well as the medical and communications sector, can access those most in need. But the destruction is so extensive that an exhaustive assessment will take time. Residents of affected areas are receiving sporadic assistance from local Nepali engineers, who have been volunteering their services to assess damages and safety issues in neighborhoods across the country. “These engineers are helping us free of charge, and I am so grateful to them,” Shankar Biswakarma, hailing from Bagdol ward in Kathmandu, tells IPS. But these charitable efforts will not be enough. The number of residents in Tundikhel, the largest camp area for the displaced in Kathmandu, has halved over the last few days. The remaining families are largely migrant workers, a 25-year-old mother of two children tells IPS. 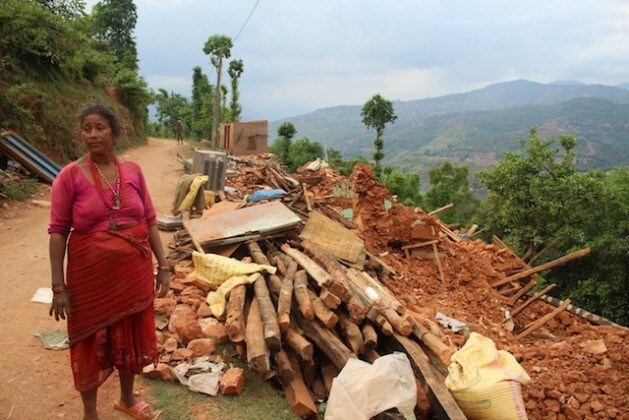 Her home is in the remote village of Deupur in Kavre district, which is among the most affected districts, nearly 100 km south of the capital. Kavre also has a record number of destroyed homes – some 30,000 lost to the quake, according to NRCS records. “The needs of the most affected families are crucial and the response is becoming a huge challenge,” NRCS Chief of Communications Dibya Paudel tells IPS. He explains that affected people are growing extremely frustrated at the snail’s pace of the emergency response, adding that the government and its relevant agencies are inundated by requests, and under intense pressure to respond to the specific humanitarian needs of million of affected people. As of May 2, the combined total pledged by the international community to the relief effort stood at 68 million dollars, far short of the required 415 million dollars needed for full recovery, according to estimates prepared by the United Nation’s Office for the Coordination of Humanitarian Affairs (OCHA). To make matters worse, aid agencies are reporting incidents of looting of relief goods before they reach their specified destination; those on the ground say families are getting too desperate to wait for supplies to reach them through formal channels. “We’re still waiting for relief but I heard the government and agencies are now scared to come because of the incidents of looting,” Sachen Lama, a resident of the affected village of Bajrayogini, 10 km from Kathmandu, tells IPS. He and his fellow villagers have been asking the community to stay calm when the relief arrives, and let the aid workers do their job so that there is no obstruction in the distribution process. “But there was looting two days ago by some local people as they were desperate, [so our] relief supplies never arrived here,” Lama says.